What is Aikido really? Is this karate? Well it is definitely not that Mr. Miyagi karate we saw on the television when we were kids. They say that aikido is the way of the harmonious spirit so in a way it is like karate but then a chiller kind of karate where you try to understand the opponent and move gracefully knowing what the next move he is going to do next. It actually is a mix of not only karate but also judo and kendo. It is a non-body contact self-defense kind of sport, which would be really nice to learn because the Japanese people really enjoy this and respect this. Imagine if there was a European who could also do this sport very well, this would be really amazing and touch the hearts of the Japanese. Their outfit while doing this sport is very respectable. Some people think it looks like a long skirt for women but I think it is very nice and I honestly would love to learn the sport and wear that outfit. Watching this sport is so amusing because they make it look so easy and graceful. Imagine if you were to get into a fight and suddenly they do not know you do aikido and you just gracefully kick the asses out of them in front of people but do not even look like you are putting that much effort. This may not be one of the really old type of martial arts, its actually fairly new compared to the rest, but it has got my vote. I would like to learn this martial art first before the rest because it already is a mix of everything so after learning this it would be so easy to learn judo or karate if you want to get into those as well. 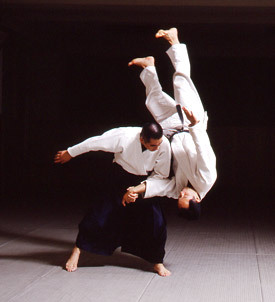 Aikido is cool because they do not use weapons. Their only weapons are there hands and their minds. How fast their hands are, make it so good to watch. Being good in this sport takes a lot of practice and determination so if you want to get good I advise you start practicing and learning it.